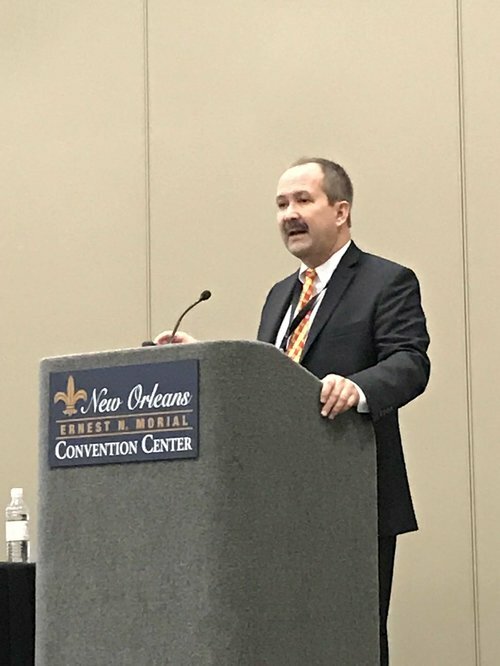 On January 12, 2019, Natalie Higgins, Vice President of Government Relations for the Equipment Dealers Association (EDA) and Stephanie See, Director, State Government Relations and Washington Operations for the Association of Equipment Manufacturers (AEM) presented during the American Farm Bureau Presidents Onlymeeting in New Orleans, Louisiana. Higgins and See took the opportunity to outline and discuss the industry's ongoing commitment to farmers and other end users. With this in mind, EDA and AEM have committed to providing farmers with a comprehensive suite of diagnostic and repair information for tractors and combines by 2021. "These new tools will complement and simplify the process that farmers use to make repairs and perform maintenance. The real objective of the EDA and AEM commitment to farmers is to minimize downtime and maximize productivity," said Higgins. "The primary thing we wanted to convey to this key group of agricultural leaders is that we are here to partner with you and this commitment is designed with the health and sustainability of farm operations in mind," added See. Higgins and See did emphasize that Right to Repair legislation was rejected in 2018 by all 19 states that considered it. See commented during to the attendees that, "While the number of states introducing this type of legislation will increase in 2019, we feel our industry commitment strikes the right balance for our industry in a way that one-size-all legislation that applies to cell phones, medical devices and tractors does not." AEM and EDA look forward to continuing the dialogue with Farm Bureau leaders in 2019. "We are here to work together and be partners with our farmers. It was an honor to present to this group of community leaders and we look forward to having the opportunity for more discussions in the future," said Higgins. Want more information on Right to Repair and the EDA/AEM Industry Commitment? Check out https://r2rsolutions.org/.